MAHESH BABU - KORATALA SIVA FILM UPDATE! After the massive success of Srimanthudu, Koratala Siva and Mahesh Babu have joined hands for another mass masala film. This untitled movie is tentatively titled as Bharat Ane Nenu, and it features Kiara Advani as the main female lead. Next shooting schedule for this project will start from November 28. Devi Sri Prasad has composed tunes for this film while Ravi K Chandran will handle the cinematography. Mahesh Babu teams up with Koratala Siva again after Srimanthudu for another commercial entertainer. The film has been tentatively titled as Bharath Ante Nenu but the makers are yet to make it official. 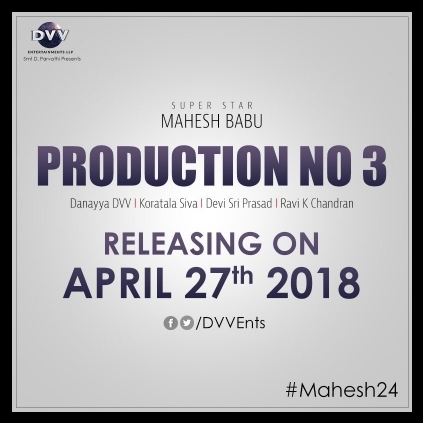 This movie funded by DVV Danayya's Production is now confirmed to Release on April 27, 2018. Devi Sri Prasad takes care of the music department while Ravi K Chandran handles the camera. The official title is expected to be announced soon. Stay tuned for more updates! People looking for online information on Koratala Siva, Mahesh Babu will find this news story useful.